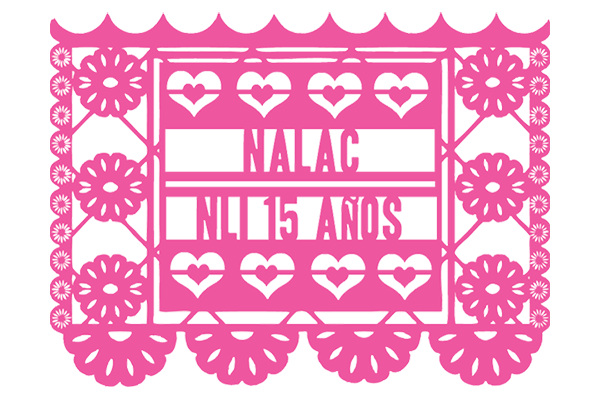 The NALAC Leadership Institute (NLI) turned 15 years old this month. In many ways, it seems kind of like a Quinceañera--it's gone through some heady developmental phases and grew wisely during its early formative years, it has enough memories to fill an archive yet keeps dreaming of the future, and its attitudinal coordinates are very much a result of our surrounding time(s) and place(s). It also feels like a Quinceañera in the sense of event. Today, NLI represents the coming-of-age of a new thought, one that sees it's self as having a leadership role within a much larger, transformative narrative. "NALAC's outstanding record of leadership for our community of artists, educators and arts industry professionals speaks for itself. I am a proud member since 2006 and twice a grantee of the NALAC Fund for the Arts, whose support has been truly significant to my development as an artist. To be a member of this organization is to belong to its extended family; to attend one of its events is reason enough for celebration!" 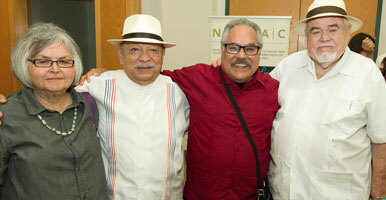 Renowned American playwright, actor, writer, and film director Luis Valdez (third from left) spoke at the NALAC Leadership Institute earlier this month. Photo by Luis Garza. The 15th Annual NALAC Leadership Institute (NLI) took place July 13-18 in San Antonio. Since its introduction in 2001, the NLI has nurtured an emerging cohort of 276 artists and arts administrators who are dedicated to sustaining culturally specific work at the core of Latina communities and dedicated to changing and shaping cultural policy. More than 180 organizations nationwide have sent fellows to our program and nearly 100 United States cities have been represented. Carlos Sandoval (NFA Grantee in 2011) of Camino Bluff Productions let us know that "The State of Arizona" was recently nominated for an Emmy Award in the category of Outstanding Investigative Journalism-Long Form. He served as director/producer with Catherine Tambini. The ceremony will be held on September 28 at Lincoln Center's David Geffen Hall in New York City.